It's been 20 years since the tragic passing of one of Rangers and Scotland's all time great footballers, Davie Cooper, at the incredibly young age of 39. The loss of one of the greatest Rangers players of the post-war era is just as difficult to comprehend today as it was on 23rd March 1995.
Cooper's professional career started at Clydebank in 1974. Jack Steedman raided the safe of the Clydebank F.C Social club and offered Cooper £300 in beer stained notes, the previous nights takings, as a signing-on fee, and the deal was done. It was a case of third time lucky for Steedman, Cooper had rebuffed his previous two approaches as he "didn't fancy two trains to get to Clydebank from Hamilton!" Steedman recalled, " If it had been a Monday, it would have been the weekend takings of a few thousand I'd have offered him!" Cooper spent three years entertaining the fans at New Kilbowie Park. The 'Bankies' of Coop's early days were a formidable team, a well-run club on a shoestring budget which won promotion in successive years in 1975/76 and 1976/77. It was his skillfull play on the wing for Clydebank which caught the attention of the country's biggest and best Clubs, which of course included Rangers. Interest in the young wing wizard came from all over the country. Aston Villa bid £65,000. Derby County, West Brom, Arsenal and Coventry all declared an interest in Cooper, who the Daily Record described as ' something special'. Cooper knocked back the advances of the big clubs from south of the border, saying he was "still learning and wished to stay at Clydebank." 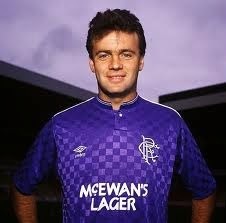 In reality, there was only ever one Club Davie Cooper was going to sign for. " I can remember Jock Stein tried to take David to Parkhead" recalls Jack Steedman. " David wouldn't even talk to me about it!" "Only Rangers Could Change My Mind"
If any proof was required that destiny had a hand in Davie Cooper becoming a Ranger, then we need look no further than the luck of the draw for the 1976/77 League Cup Quarter Final. Rangers had been picked out the hat to play Cooper's Clydebank in a tie over two legs. The tie was eventually decided after an epic 4 match marathon, including two replays, in which Davie Cooper showed the country, and more importantly, Rangers boss Jock Wallace, why he was so sought after. He scored in 3 of the 4 matches. After the first tie at Ibrox which ended 3-3 with Cooper scoring with his RIGHT foot, the Rangers News wrote, " Clydebank will pull in spectators anywhere as long as they have the boy Cooper on their wing. A young man with a lot of confidence and ability, he raised expectations every time he got the ball." Cooper recalls taking the ball past John Greig within 30 secs of the game starting only for him to be booted up into the air. He turned round expecting an apology from Greig only to be told, " Next time you do that, I'll hit you even harder!" Cooper and Greig in more friendly times! He continued to impress in the remaining 3 matches it took Rangers to dispose of Clydebank. The second replay at the neutral venue of Firhill saw Rangers triumph 2-1. Cooper scored Clydebank's only goal with a trademark free kick, " sending a curling lob over the defence and past Kennedy from 25 yards." Again, the assembled hacks were noteworthy in their praise of the 'magic man'. "Cooper again showed his class with a run that took him past 4 defenders. Then the winger set up another chance. He was in magnificent form. He beat Miller three times, then took on Greig twice and still came away with the ball." Davie Cooper had made his mark on Rangers and Jock Wallace. He was offered the chance to sign, and declined. " I didn't turn them down because I didn't want to play for them. It was just at that point I didn't think I was good enough. I wanted to stay at Clydebank and learn my trade." 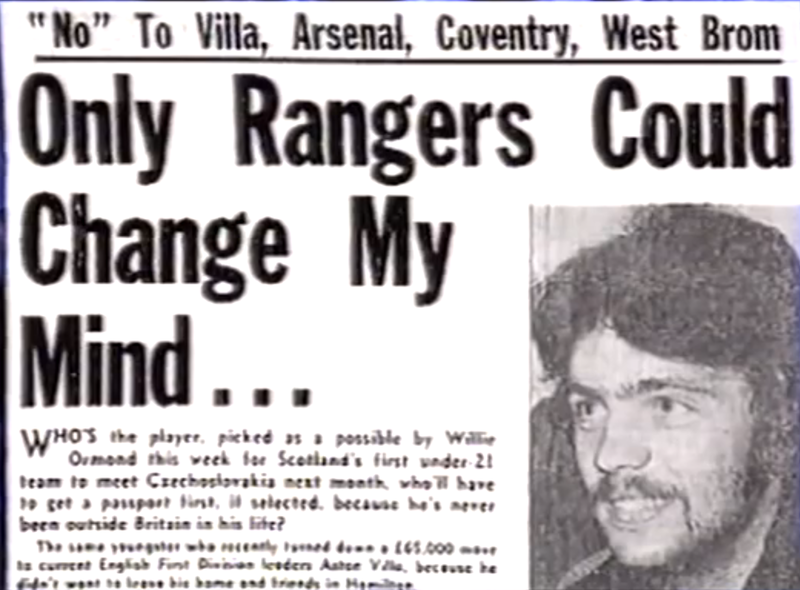 he told the Rangers News in June 1978. It would be 8 months before Jock Wallace got his man, and Rangers a future great. 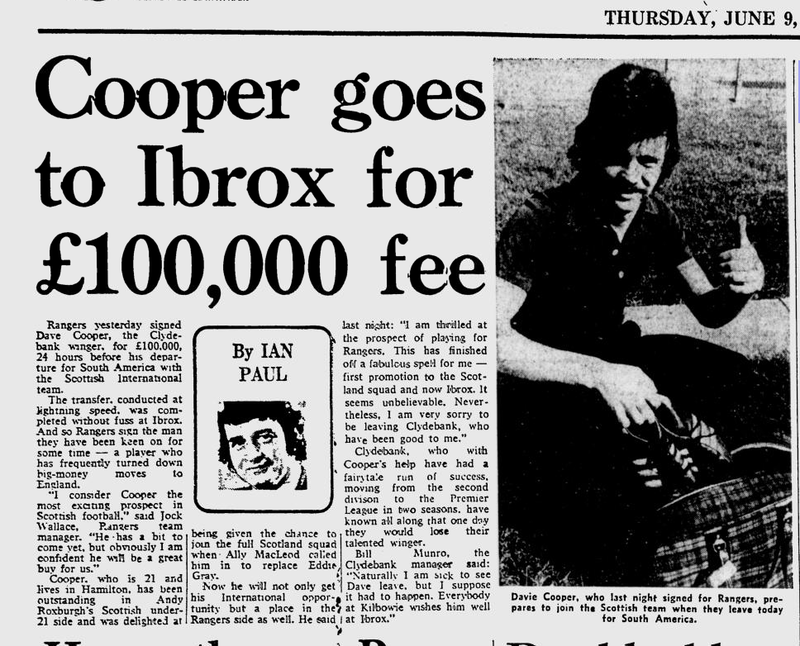 The first Cooper knew that Rangers had renewed their interest in him for a second time was when he received a phone call from Jack Steedman. 24 hours later, he had signed. The Daily Record described Cooper as , "The most expensive product from Clydebank since Cunard Line accepted delivery of the QE2!" so it was fitting that the day after loyal subjects of QE2 had thrown street parties the length and breadth of the country in celebration of her Silver Jubilee, that Davie Cooper had cause for his own celebrations. The £100,000 transfer fee equalled the previous highest fee paid out by Rangers when they purchased Colin Stein from Hibs in 1968. In a feature celebrating his first twelve months as a Ranger, in the Rangers News of June 14th, 1978, he said, " I always wanted to play for Rangers. When I was a youngster a supporters' bus used to leave from just across the road from my house and I used to be on it nearly every other week. I went to watch Rangers at every available opportunity. I didn't ever think I would play for Rangers, but I don't mind admitting I used to think a lot about it when I was nine or ten. But, then, just about every kid who wants to be a footballer thinks he will play for a big club team some day, don't they?" 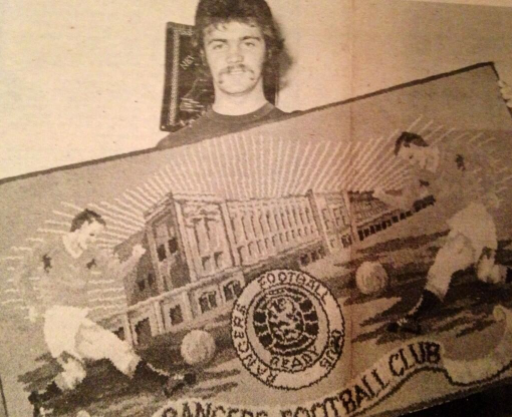 Super Cooper with his own Rangers rug, hours after signing for Rangers.
" 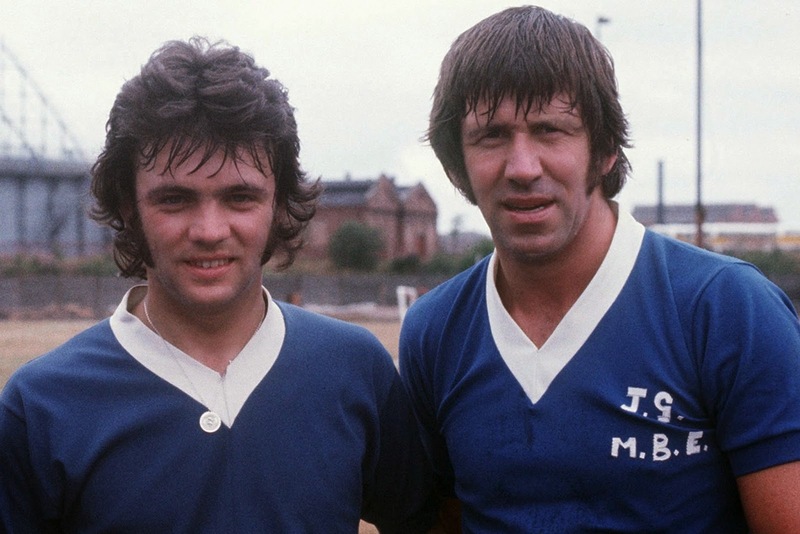 I'm a Rangers supporter, and I spent the bulk of my career playing for the Club I loved." Thanks Gary. Great read about a truly great player. Watched him at Rangers, seen him on tv for motherwell and watched him for Clyde. He was still a stand out player at the end of his career. I'm a Celtic fan. 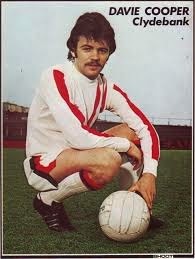 Davie was a brilliant footballer. May he rest in peace.